I have been slacking on my blogging! It has been nearly three weeks since I posted a new article to my blog. That is not because I have not been out enjoying nature and photographing what I experienced. Rather, it is because I have been out shooting but not processing my images, and also working at my consulting engagement. Something is going to have to give, and it is not photography! Actually, in about three weeks, I expect to be off for three months and have plans for many photography trips. Two weeks ago, I picked up a friend (Ceasar Sharper), who is also a serious photographer, at 5:30 AM, and we drove about 115 miles to northern Maryland to Conowingo Dam on the Susquehanna River to photograph eagles. The dam is located about 9 miles from where the river empties into the Chesapeake Bay and 5 miles south of Pennsylvania. When construction of the dam was completed in 1928, it was the second largest hydroelectric project by power output in the United States, only behind Niagara Falls. 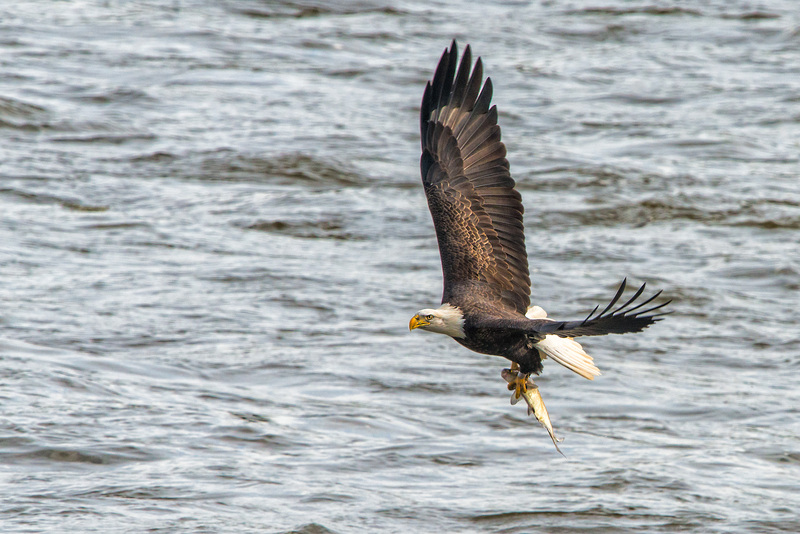 In the fall, and in particular in November, the dam is well known as a location to see American Bald Eagles, and it is not uncommon to see as many as 100 eagles feeding on fish in the Susquehanna River. The eagles and other birds congregate around the dam, because when the dam is opened to power the generators, the water flowing through the dam churns up fish for the waiting birds. 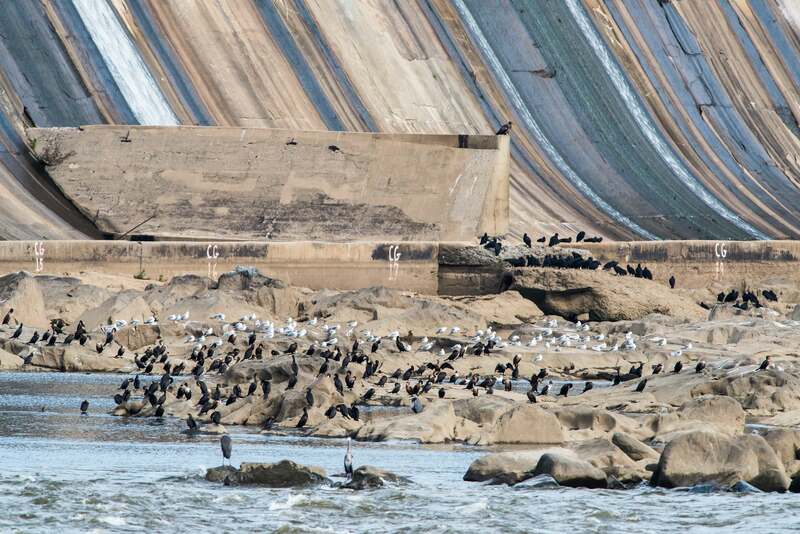 Below you can see the hundreds of well-fed Cormorants, Blue Herons, and gulls at the base of the dam. If you click on the image and look closely, there is also a juvenile eagle sitting on the end of a concrete embankment. It was my second visit to the dam, the first was after photographing sunflowers in early September. The farm where the sunflowers were located was within about 25 miles of the dam, and I wanted to check it out for future trips. When I was there in September, I did not see any eagles, but two other photographers said they had photographed one earlier in the morning. My trip this Saturday was different. There were about a dozen eagles, several adults, but mostly juveniles. 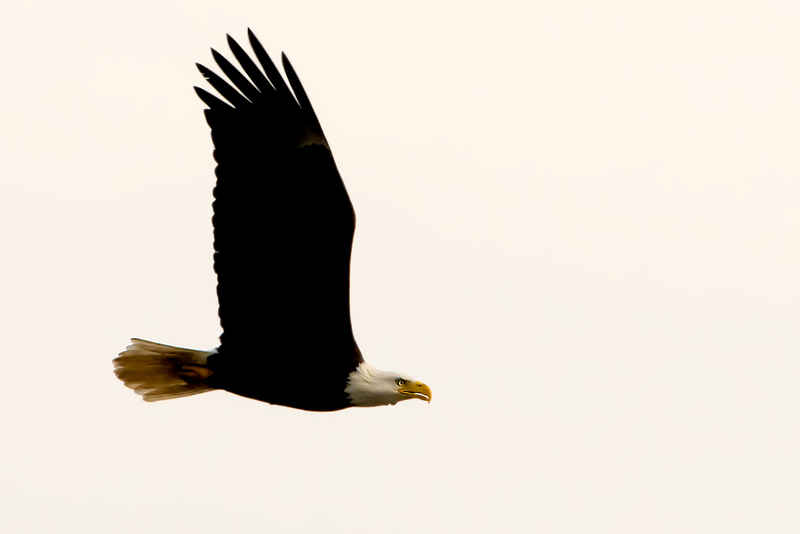 Although there were about a dozen eagles, there was limited action during the day. The eagles only occasionally ventured from their perches high up in nearby power line towers. The light was also not the best for photographing flying birds, since it was overcast most of the day and a high shutter speed is a necessity, which meant shooting at a high ISO. Nevertheless, I managed to capture some decent images. Below is an adult eagle at the moment after it broke the water with its talons to capture a fish. The image that follows is the same eagle as it lifted from the river with its catch. The above image is my favorite of the day. Unfortunately, it was the only opportunity to photograph one of the eagles capturing a fish, and it happened soon after arriving at the dam. Click on the image to see it in detail and notice how it appears to be watching me as I photographed it. 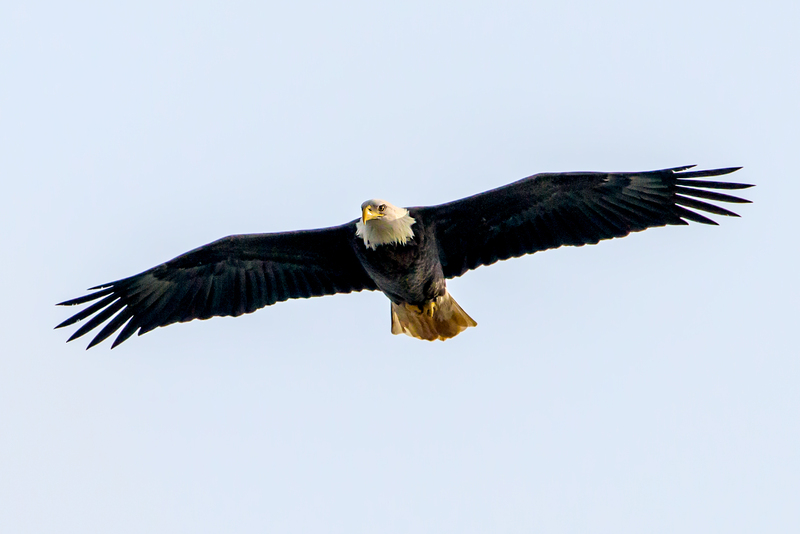 The following are some other images of adult eagles as they flew around the dam and river. 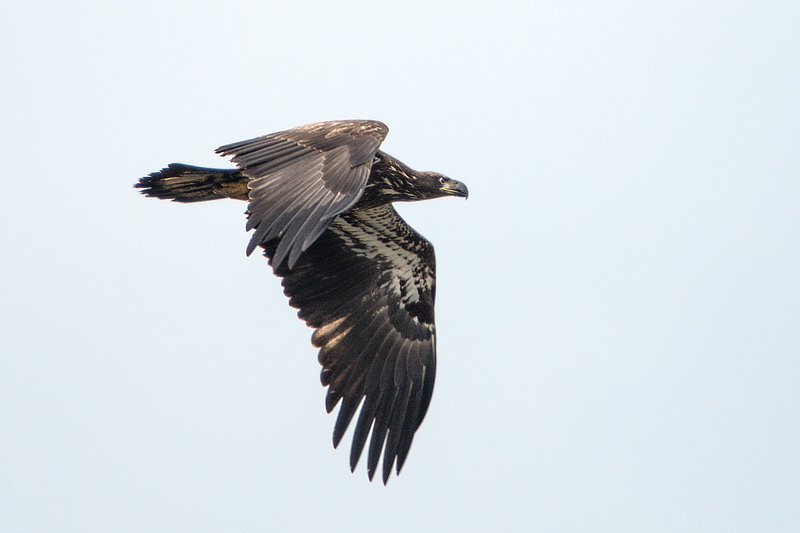 Besides adult American Bald Eagles, there were many juvenile eagles flying around the dam and river. 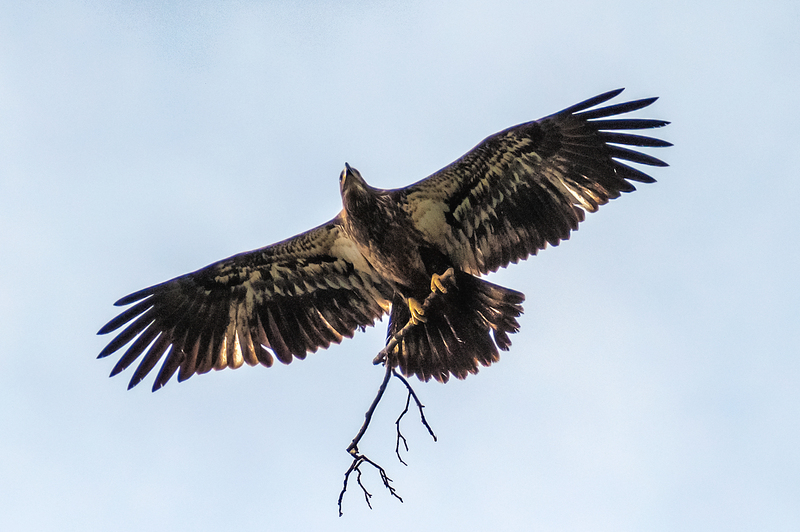 Juvenile eagles are easily distinguishable from the adults because they do not have white heads and tails. It takes about five years for an eagle to attain white head and tail feathers. Below are images of a few of the juveniles. Besides enjoying the sight of these majestic birds, across the river a group of terns occasionally took flight, when an eagle got too close. When the terns nervously flew about, their white bodies were brightly lit by the early morning sun. Also making the day a great nature photography outing were the Cormorants that were catching fish (and an eel) in the river. Below are a few images of those activities. 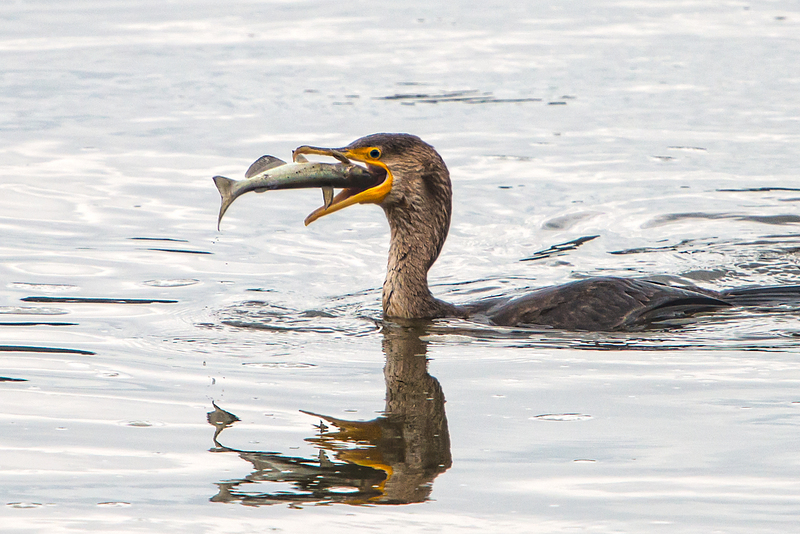 The Cormorant worked the fish around until properly positioned for head-first swallowing. As you can see from the above images, Ceasar and I had a great day at the dam. We are planning a trip next weekend, when we expect to see and photograph many more eagles. 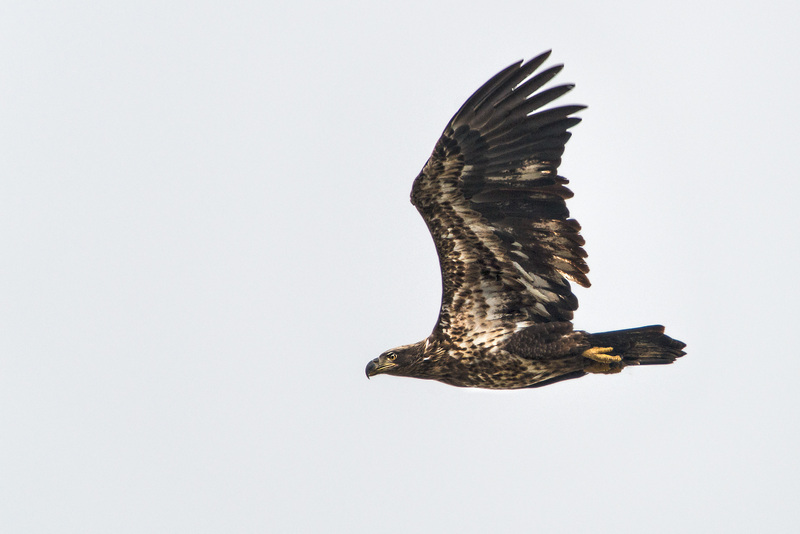 Recent reports from other photographers, who have been to the dam, confirm that many more eagles have arrived for their fall feast on shad and other fish. 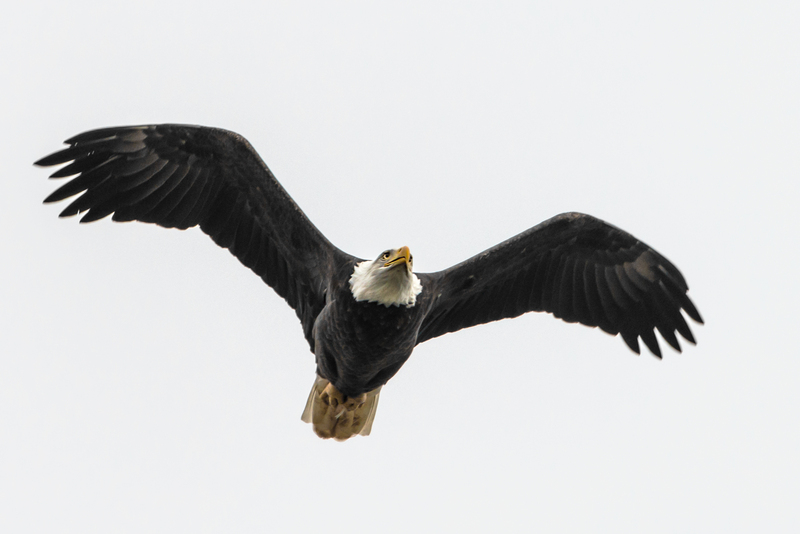 This entry was posted in Bird Photographs, Nature, Wildlife and tagged american bald eagle, Conowingo Dam, eagle, nature, Photography. Bookmark the permalink. Absolutely incredible! Looking forward to your next post. The sneak peek photos are lovely! Nice shots! 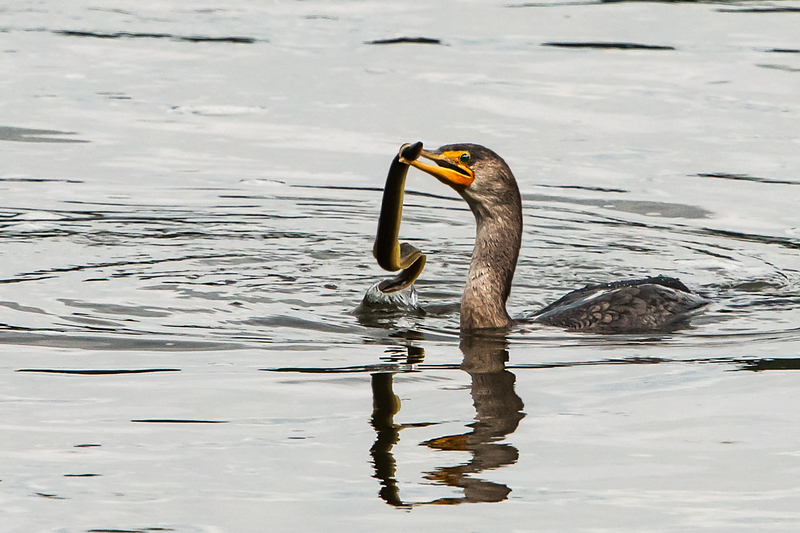 You already know that I love the second eagle shot, but the Cormorant with the eel is especially nice as well. This is a very good preview for my first trip to the dam in the very near future. Great post! Thanks Ernie. 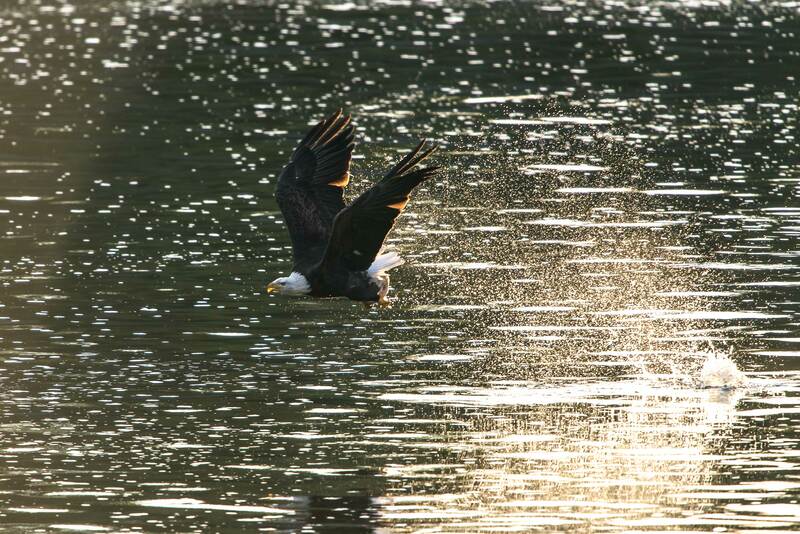 You are going to enjoy shooting at Conowingo Dam. Looking forward to next weekend. 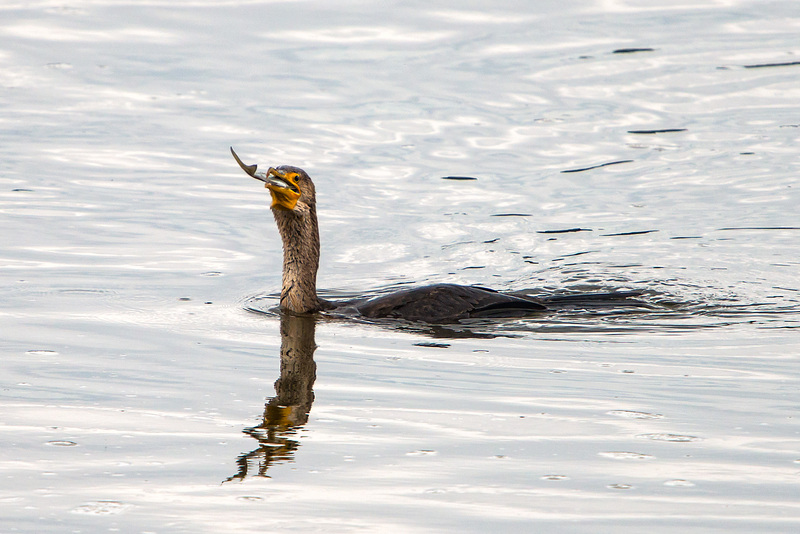 Love the cormorant eating pics! When you combine the beauty of these birds with the skill and patience of a experience photographer one gets priceless photographs and so be it. Nice blog and amazing capture! That looks like huge eel caught and putting up some fight here! But in the end the bird was able to win the battle and gulp that whole thing down okay really?? It seems like it would have trouble fitting down that long/skinny neck. Also, if actually eaten, does the unlucky prey get swallowed kicking all the way as well? !